20 - Bottoms up ocean sampling! In recent weeks I've become accustomed to live images of the deep ocean. I now realise that if we lived on the seafloor we would probably know a lot more about it. It's easier to learn about things we can see and touch – and so not surprising that we've learnt more about our close surroundings than the farther horizons of our planet and solar system. To fill the gaps in understanding, scientists often explore parts of our world that are difficult to reach like our polar wildernesses. Oceanographic scientists inherently face a similar challenge – examining our remote oceans to learn how the planet functions. But there is a mismatch in our understanding of ocean chemistry for instance, between its surface and deep waters, which I think reflects the obscurity of deep waters from our view. Expeditions like these, which bring cameras to the unseen ocean floor, remind me just how different our understanding of oceanography would be if we had begun ocean exploration from the bottom, up. The seafloor, viewed from the remotely operated vehicle Isis, is an endless field of chemical interaction between minerals and seawater that is rich with life – somewhat reminiscent of the thin line between land and atmosphere that we call home. From the bottom of the ocean, the view up is often bleak. Ascend just a few metres and all that you're likely to see is vast and empty, but there is undoubtedly more here than meets the eye, we just don't know it yet. Seawater chemistry in the surface ocean is anything but even or empty. In fact, there is a complex ecosystem in the surface layer of the ocean nourished by dissolved nutrients, metals and gases that is responsible for pumping carbon between geologic and atmospheric realms, and is also sensitive to subtle changes in seawater composition. We know this because we've looked there many times, in many parts of the world, and made countless measurements, to build a detailed knowledge of chemical interactions in different areas. Our understanding of bottom water chemistry however, and its impact on global ocean processes, such as carbon cycling, nutrient supply and transport, is naive compared to the surface oceans due to the scarcity of measurements near the seafloor. A mismatch in surface and deep ocean observations is anticipated given the difficulty of sampling close to the seafloor from far above, but precision instruments like Isis are pioneering new measurements of deep water and sediments; the Isis piloting team has been operating 24 hours a day, diligently sampling the seafloor in a way that conventional methods never could. 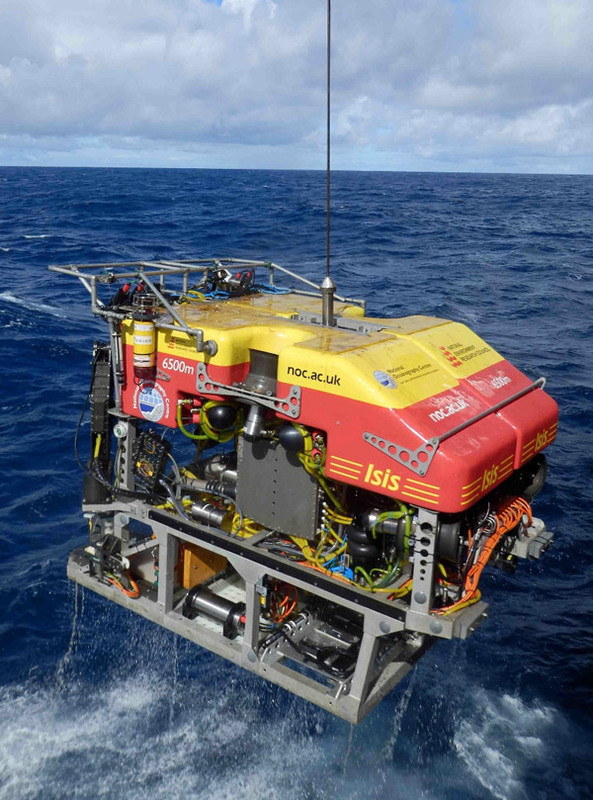 It is an exciting time to be an oceanographer - a step change in understanding ocean chemistry will come from the partnership of science and technology in deep-sea research. From what I have seen in recent weeks, the Isis team of the National Oceanography Centre has exemplified the power of this cooperation with scientists aboard the RRS James Cook. Long may this partnership continue! Pete Talling points out the island of Montserrat. The hazy cloud is ash blowing off the flank of the volcano behind which is the slowly inflating volcanic dome and the devastated town of Plymouth. After four days we are now just off the volcanic island of Montserrat for voyage JC083. This island is one of the Lesser Antilles island arc, a chain of volcanic islands that marks the western edge of the Caribbean. Island arc volcanoes form where the ocean crust is consumed back into the Earth’s interior at deep-ocean trenches. The best known of these are the trenches surrounding the Pacific Ocean, and the island arcs are popularly known as the ‘Pacific Ring of Fire’. In the Caribbean, the Lesser Antilles arc is also a fiery phenomenon. No more so than at Montserrat, which over the past 20 years has been devastated by a series of volcanic eruptions. The capital city of Plymouth is just a ruin now, barely visible below the thick carpet of ash and debris erupted from the volcano. Our task here will be to trace the trail of devastation out to sea. Surge deposits, dumped by hot clouds of ash and gas at temperatures of hundreds of degrees Celsius and travelling at many tens of kilometres per hour scour the land over which they travel and rush out over the sea where they eventually dump millions of tonnes of debris onto the seafloor. No one knows what these deposits look like, or what effect they have had on the seabed below. Using the ROV Isis, we will make highly detailed maps of the deposits on the seafloor. Then, with a new piece of equipment called a vibro-corer attached to the ROV, we will take cores from these deposits to examine the physical and chemical effects of these highly destructive volcanic eruptions. 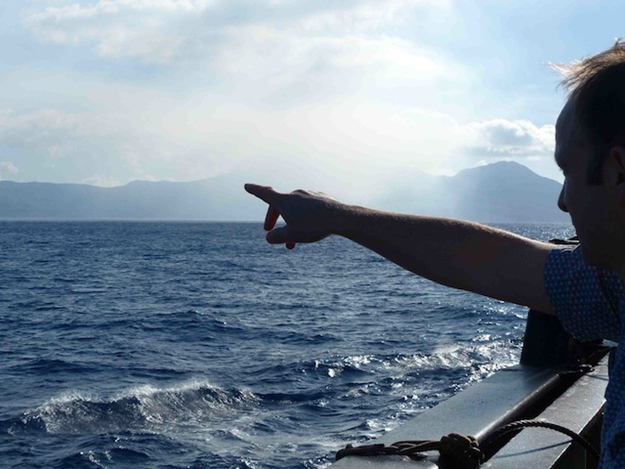 Pete Talling is leading this part of the expedition and hopes to be the first to make a study of an underwater volcanic surge deposit. To get the shallow part of the deposit, Captain Peter Sarjeant has special permission from the volcano observatory to take our ship, the RRS James Cook, inside the exclusion zone and to within a kilometre and a half of the coast just off the devastated town of Plymouth. Already, we can see and smell the ash cloud blowing off the side of the volcano.